This shivasthalam temple can be reached from Villupuram from where town bus services are available.One can also reach Tirvuakkarai from Pondicherry by travelling to Vanur via Tiruchitrambalam Kootu road and and then to Tiruvakkarai from Vanur. 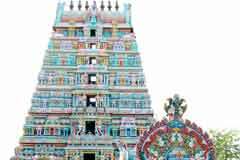 The temple can be reached by traveling in the bus that ply on the Thindivanam-Pondichery route through Mailam and by getting down at Perumpakkam. The temple is located at a distance of 7 km from here. The Lord of the temple is praised in the Thevaram hymns of saints Tirugnana Sambandar and Sundarar. This is the 30th temple in Thondai Naadu region praised in the Thevaram hymns. Karthikai Deepam in November-December are the festivals celebrated in the temple when special pujas are dedicated to Mother Vakrakalai Amman. Devotee crowd is huge on Tuesdays, Sundays, Ashtami and Navami days. Though a Shiva temple, Mother Vakrakali is all prominent in the shrine. Devotees pray to Lord Shiva for mental peace, for relief from adverse planetary effects, removal of obstacles in undertakings, for removal of adverse effects following from last birth, for safety and welfare of children and for total solutions for any problem threatening self and the family. Besides seeking above boons, devotees pray to Mother Vakrakali for happy wedding long delayed by lighting lamps in the Deepa Lakshmi shrine in lime cups, tie mangal sutras. Devotees place their appeals to Lord in writing and tie them in the Trident. Those seeking happy wedding, contribute mangalsutras, offer Sari and garlands to Mother. Those seeking child boon place cradles and offer coins equal to their weight called Thulabaram. Traders offer contributions for temple maintenance and renovation projects. Abisheks are offered with milk, green coconut curd, sacred ashes-Vibhuti, sandal, panchamirtham, honey, turmeric powder etc. They do Alankara-dressing to Mother Vakrakali with sandal paste. Those regarding Vakrakali as their family deity, tonsure their heads, conduct ear boring ceremonies for children, roll around the prakara (anga pradakshinam), offer chain lamps-Saravilakku and Kuthuvilakku, and light ghee lamps. Devotees perform 1008 Kalasa (pots) abishek to Lord along with abisheks with other usual items. 1008 conch abishek to Mother Vakrakali, and milk abishek of 1008 pots of milk. They offer sari to Mother. Devotees prepare Prasad and distribute to visitors and also arrange feeding Annadhan. The presiding deity graces as a Mumukha Linga-three faced Linga. This is a very rare form. The Atma Linga is on the western side of Kali Shrine also known as Kanda Lingam worshipped by demon Vakrasura. This Linga is very cool during summer. Water pearls stay on the Linga during monsoon. Sri Chandramouleeswarar Temple, Tiruvakkarai Post-604 304, Villupuram district. A Rajagopuram with seven levels and with beautiful carvings stands majestically at the main entrance of the temple. The Rajagopuram, kodikambam and Nandi all are located side by side. If we turn to the left after entering through the Rajagopuram, we can see the sannidhi of Vakrakali Amman. Opposite to this is situated the sannidhi of Athmalinga, facing the west. To the left is situated parrot tower and Nandi is located facing it. 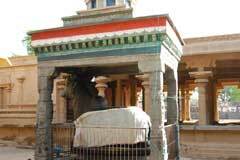 To the right of Nandi is located a 100 pillar mandap, which is called Thirukalyan mandap. Then, we can reach the sanctum.The presiding deity is portrayed as a three face linga. Dwarabalakas are seen each on either side of the sanctum. At the inner circle of the sanctum, we see the statues of Nalvar, Vinayaka, Subrahmanya, Vishnu, Durga and Arthanareeswara. To the south of the sanctum is situated the jeevasamadhi of Kundalamamuniva, a siddha. Opposite to this, we see the sannidhi of Sri Varadaraja Perumal, facing the west. At the back of the sannidhi is situated Sahasralinga sannidhi, facing the east. 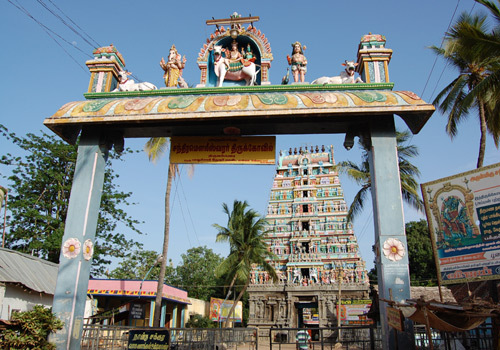 Navagraha sannidhi is situated opposite and Vadivambika sannidhi is situated near it, facing the south. As all the sannidhis here are in a vakra state, the sthala is considered a vakradosha nivarthi temple. Lord Muruga in the temple is praised in the Tirupugazh hyms of saint Arunagirinathar. Lord Chandramouleeswara is also praised as Chandrasekhara, Piraisoodia Peruman. Mother is praised as Amirthambikai, Vadivambikai. There are two famous Lord Shiva temples with nPanchamukha Liga (Linga with five faces) only in Nepal in North and Kalahasthi in South in Andhra Pradesh. But a three faced Linga Mummukha Linga is only at Tiruvakkarai. The Mukha looking east is Tathpurusha Linga, the one facing north is the Vamadeva Linga and the one facing south is the Agora Linga. Agora Linga has two sharp teeth on sides, visible only during abisheks. There are many things in the temple that are vakra in nature contradictory to tradition. The flag post is slightly on the north side. Generally, one can have the darshan of the deity from the very entrance under the main tower. None of main features in the temple-the Rajagopuram, flag post, Nandhi are on a straight line and are found away from one another. The devotee crowd in the temple is huge at 12.00 p.m. (midnight) on poornima-full moon days and 12.00 a.m. on new moon days when Jyoti darshan is offered to Mother Vakrakali Amman. That is the light lit above the tower mandap. This darshan is very important for the devotees. The Sri Chakra, installed by Acharya Sri Sankara is on the left of Mother Vakrakali. The discuss of Lord Varadaraja Perumal is differently seen in the temple. This is the place where saint Kundalini Siddha attained Samadhi which is within the temple itself. The ear rings of Mother Vakrakali are designed as a little child. Mother Vakrakali graces in the temple in a smiling merciful form Shanta Swarupi. The crow, being the vahan of Sani Bhagwan is on the left against the right. Those facing Vakra Sani period (some times planets use to move retrograde called Vakra), pray here for relief from its effects. The cremation ground is just opposite Mothers shrine. Lord Varadaraja Perumal destroyed demon Vakrasura. Vakrakali destroyed Dhunmukhi, sister of Vakrasura. Dhunmukhi was pregnant when Kali attacked her. According to rules, killing a Shisu means child is a sin. So Vakrakali took out the child from her womb and wore it as ring on her right ear. As Kali destroyed the sister of Vakrasura, She stayed here in the temple as Vakrakali. She was in a furious temper. Acharya Sri Sankara cooled down the Goddess by installing Sri Chakra on Her left leg. As Kali is the deity for the serpent planets Rahu and Ketu, while circumambulating the shrine, 4 rounds should be clockwise and 5 anti-clockwise. 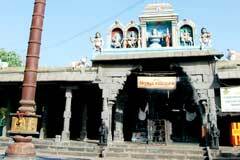 The place became popular because of the grace of Mother Vakrakali Amman. The place is known as Vakra Shanti Tiruthalam. The idol of Mother Vakrakali is so devotionally sculpted as Patteeswaram Durga, Chidambaram Brhamma Chamundeeswari and Thillai Kali. Traditionally, Kali temples are at the border areas of the place. At Tiruvakkari, the shrine is under the Rajagopuram of the main Shiva temple at the entrance. The idol of Vakrakali is awe inspiring. The head has flame hairs. A skull is the crown. The ear ring is the Sishu in the right ear. She has eight hands. The right hands hold weapons asPasam, discuss, sword, skull of a wild animal. She is also wearing a garland crosswise of the heads of the demons as the upper sari ending on the right hand through breasts. Arulmigu Vaaymoor Naathar Tirukkoil, Tiruvaaymoor,..
Sri Vandurai Nathar temple, Thiruvandurai, Thiru..